This is a sample entry from Craig Turner’s weekly market analysis newsletter, Turner’s Take, published on January 8, 2013. On Friday, January 11th at 11:00 am central time, the USDA will release the January WASDE, Annual Crop Production for Corn & Soybeans, December 2012 stocks, and Winter Wheat seedings. The January 11th USDA report is a very important grain report. We have had limit moves in at least one of the major grain markets five of the last six years as a result of this report. This year’s report probably has more downside risk than upside surprise. 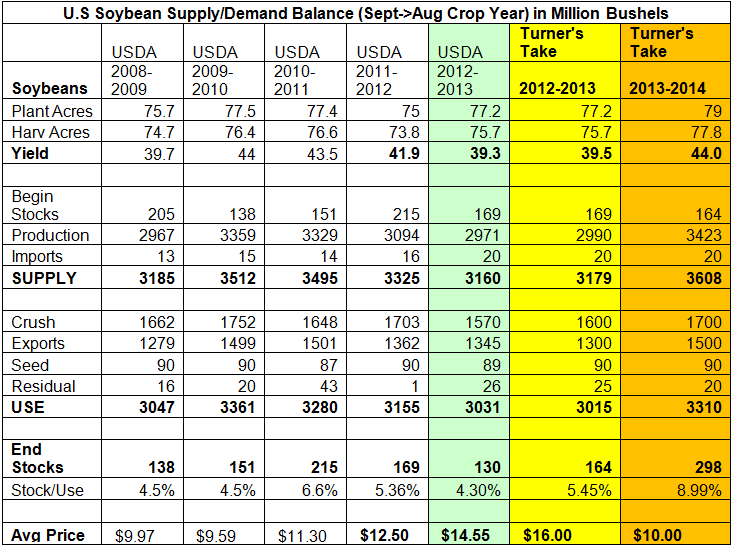 We have had some very high corn, wheat and soybean prices this year. High prices have a way of reducing demand as new supplies emerge from all over the globe. 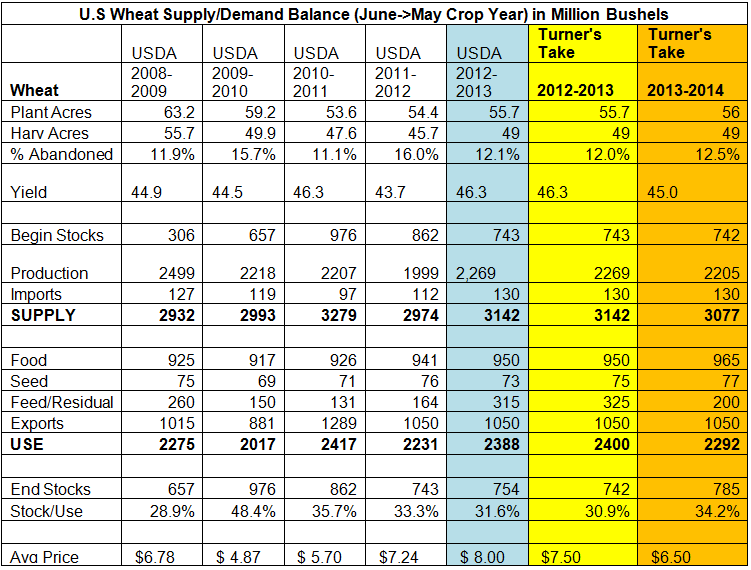 Demand for Corn, Wheat and Soybeans have been moderate at best. Exports have been very low and far below last year’s pace. The rest of the world is buying grain and soybeans from other countries and lower prices. China is cancelling hundreds of millions of metric tons of soybeans in the US so they can buy cheaper South American soybeans. The world has learned to use corn and wheat interchangeably for feed, and will use whichever one is cheapest and readily available. Even the ethanol market appears to be hitting a top as production and government mandates seem to level out. I am bullish on corn and soybeans in the very short term because we could see situations where the cash market has a real shortage and we have a price spike. However, once South America comes on line and exporting grains and soybeans, the shortages will stop. If the US gets a normal crop this year with a bumper South American crop, we could have drastically different Corn, Wheat and Soybean prices than what we have today. When the report comes out on Friday, the first numbers I will look at is the old crop ending stocks. I think we will draw down a little bit to 626. That would be mildly bullish for march corn and it would be bullish for our CH/CN bull spread. If the stocks go down, the cash grain shortage trade should be on for January. If stocks are higher, I think we sell off 10 to 20 cents with the potential to go limit down if the report is very bearish. I think new crop is going to shock some people when we really get into the numbers in February. 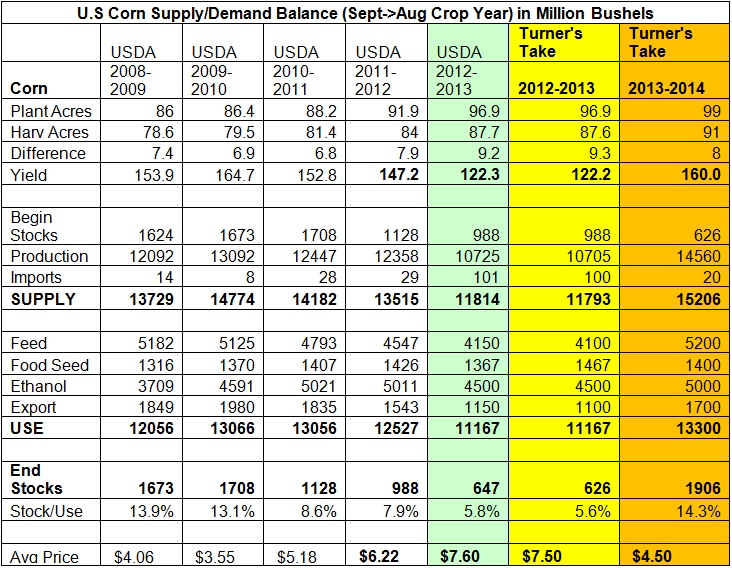 For now I will add my 2013-2014 corn estimates. 91 million acres harvested with a 160 yield puts us a 15+ billion bushel crop. If that comes to fruition, I think we see $4.50 corn at harvest. Soybeans have been in a bear market lately as the market focuses on a record South American harvest. When you also consider that US new crop beans could be looking at 78 million harvested acres, a 44 bpa yield, and a 3.4 billion bushel production, we could have a carryout close to 300 million bushels. If we get a normal weather season in the US and a good soybean crop, November Soybeans could be sub $10.00 by harvest. I like selling November Soybeans here but it may be too much risk for traders heading into the report on Friday. I also like selling the mini or getting into a put spread. We will not have a good picture of potential soybean production for new crop until the February Ag Forum, but I will include my early estimates below. Winter Wheat Seedings are part of the Jan 11th USDA report. We expect Wheat to have a good crop that will add to already plentiful supplies. I have been bearish on Wheat and continue to be bearish. I like bear spreading wheat and selling it outright.